Yep, amazingly we got out on time yesterday, after weeks of prep. Well, almost. We aimed for a late afternoon start, just to get a few miles in before the real push started on Friday, and we got out about 5:30 p.m., which was 90 minutes later than optimum. But that required only an adjustment to plan, and as you’ll see, everything worked out better than expected. The Airstream is looking happy to be back on the road. It’s been tweaked, cleaned, painted, washed, lubed, and tested. It So it was no surprise that our first 150 miles were completely uneventful. I was particularly happy with the new position of the backup cam. Now that it looks down on traffic, it’s useful after dusk (when previously lights from cars would blind it) and I am getting a much more better picture of the traffic situation behind us. We weren’t out to accumulate a lot of miles given our late start. The plan was just to make it to Deming NM and crash for a night at Rock Hound State Park. Since we were late, we opted to stop in Lordsburg NM instead, which is a small blip along a very lonely stretch of I-10, known mostly for having truck stop and hotels. There is one campground there. When we arrived in the dark, the office was closed (no surprise) and there was an after-hours board telling us the usual procedure: pay here, pick out a site. I looked at that board for a minute. Three people for a night, $37. Cash only. I thought about our three years of full-timing. 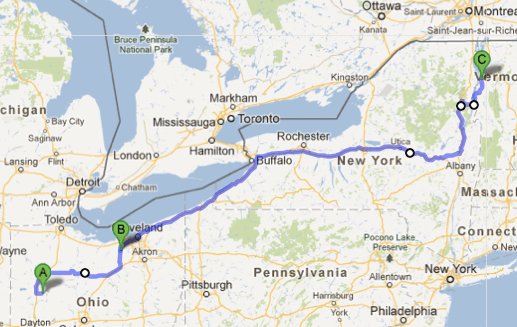 And then I thought, “Nah.” We had just left home 150 miles ago. We had full fresh water, empty holding tanks, and solar panels. At 4000 ft elevation the night was forecast to be deliciously comfortable for sleeping. Why did we need, or even want, a campground? So we went back to a restaurant we had spotted on the way in, which advertised ” RV parking,” went in to ask about dinner (they had just closed) and asked if we could park … Before Eleanor could finish her question, we got a “No problem,” and from there we spent a pleasant night with the windows open and cool breezes floating in. I slept extremely well and had magnificent dreams, and I awoke thinking, “Being here in this Airstream, in this bed, with this person, is absolutely perfect.” Although we had hundreds of miles to cover, I didn’t want to get out of bed. That was a bit of roadtrip magic, the kind that I miss from the full-timing days. We delayed probably more than was ideal, dawdling over (very good) breakfast in the restaurant, puttering a little in the Airstream, but finally got moving and pushed on through New Mexico and west Texas, with a brief stop to pick up barbecue in El Paso. 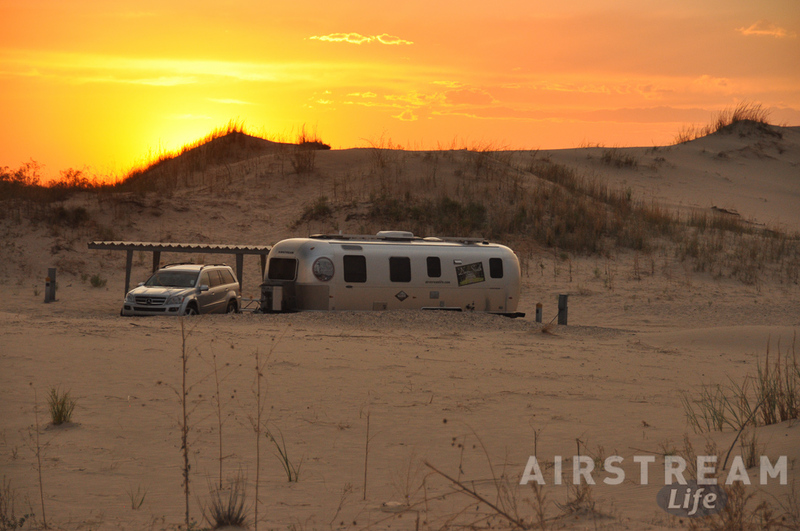 We ended up, 417 miles later, at Monahans Sand Hills State Park a couple of hours before sunset in 102-degree heat. I’ve been here once before, with the Caravel, but for Eleanor and Emma it’s the first visit. After dinner (the barbecue we picked up along the way), they discovered for themselves how beautiful this park gets when the sun is low on the horizon. Although it was still well into the 90s at that time, we took a walk around the campground loop and everyone went a little nuts with their cameras. We’re going to be in the “logging miles” mode for a few days, so our stop here will be just one night. It would have been nice to make our usual leisurely plod across the country, but to do that would have required leaving at least a week ago, and that just wasn’t realistic. So we’ll bolt across the vastness of Texas, and through Arkansas and beyond before pausing. Still, a few moments like last night and this evening’s sunset will make the hours of driving feel a lot more worthwhile. I drilled a hole in my Airstream. Of all the jobs to be done on the Airstream this spring, this one scared me the most. Anticipating it was worse than building new cabinetry, worse than de-greasing the hitch & sanding off the rust, worse than laying inside the front compartment and re-wiring (I’ll tell you about that one later). 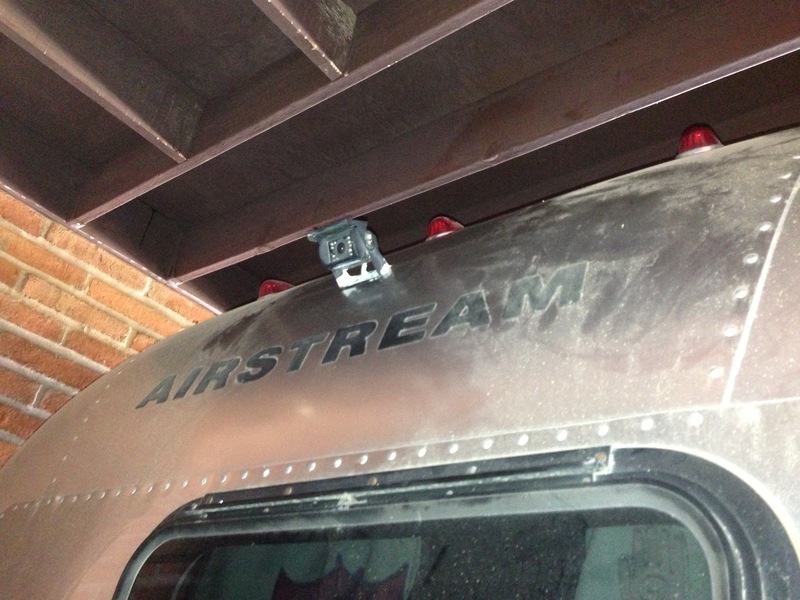 The backup camera I installed on the Airstream three years ago has been very useful, but I made a serious mistake when I put it on the rear bumper. That location was easy to reach but far too low. As a result, car lights and setting sun would create glare, making the camera useless at dusk or at night. I found that I needed the camera much more while towing on the highway, for situational awareness (i.e., what’s happening behind me) than I needed it for actually backing up. So losing the camera’s functionality because of glare was a real annoyance. Also the low position gave me a great view of the stripes on the highway and the bumper grill of the car behind me, but not of cars further away. Because it’s a “backup camera” the field of vision is very wide, like a fisheye lens, and so the useful distance range isn’t long. To get any sort of overview of the traffic situation it needs to be mounted up above the roof of the average car. I knew all this after the first season of towing, but I also knew that the only way to get the camera up where it belonged would require drilling a hole in the rear dome of the Airstream. Not a small hole either, but a whopping 5/8″ hole to fit the cable connector through. I have never drilled a hole in the body of the Airstream before. It’s sort of a forbidden thing, in my book, because every hole is a new chance for a leak, a spot that must be maintained with caulk, and something you can never un-do. Remember, I just had to deal with a 3/4″ hole that was drilled in the roof eight years ago for the original cell phone antenna. At least that hole was up on the top where nobody can see it. This particular hole was going to be right smack in the middle on a very expensive & very visible piece of shaped aluminum, where a virtual waterfall is created every time there’s rain. If I screwed it up, I’d be looking at an ugly patch forever. This may explain why I put up with the inadequacies of the camera mount for three years. With all the other projects completed, and perhaps a bit of bravery inspired by their relative success, I had no excuse to avoid this one any longer. The re-routing of the cable was easy: it was already in the bumper compartment, and from there it took only two holes inside the rear compartment to run it up into Emma’s bedroom. A four-foot length of plastic wire chase from the hardware store hid the wire as it ran up Emma’s bedroom wall, and then … I had to face the final cut, right through two layers of aluminum, some fiberglass insulation, and out to the cold, cruel world. The camera is now in place, secured by a very high-bond double-sided automotive tape, and sealed with Vulkem 116. I wish I had gray or black Vulkem for this, because the white caulk smears look stupid on the black camera mount, but eventually I’ll get my hands on some and re-do it. In the meantime, it works and the view from the camera is much better. So I drilled the Airstream, and survived. But I don’t want to do it again anytime soon. After a good run of posting every two days for a while, I had to shut up and focus entirely on work. I have been monumentally busy the past several weeks, but you don’t want to hear about that. 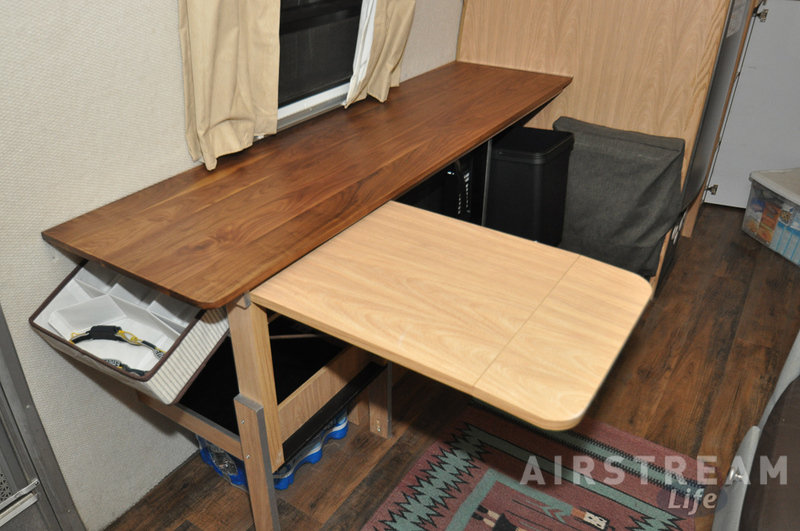 The most interesting part of it (Airstream-wise) has been finishing up the cabinetry project that I began before our last trip to California and Nevada. If you haven’t read back that far, here’s a re-cap: We wanted to get rid of the tired old laundry & microwave rack that we whipped up while full-timing, and make the area more functional. I removed everything on the curbside of the trailer from the entry door to the refrigerator wall. Originally this was a fold-out credenza with two huge chairs, as shown in the floorplan. Those chairs took up too much space and we got rid of the first one before we had even towed a mile. (As far as I know it is still serving as bachelor apartment furniture in Ohio.) The second one exited while we were full-timing. We stopped in Florida for a few days and a friend fabricated a counter extension to run along the curbside wall (atop a narrow shelf that isn’t depicted in the floor plan). We bought a cheap wire rack at a housewares store and muddled the whole thing up into a storage space for a microwave and a small laundry bin. This was a little crude but it worked for six years. Eventually we started keeping our recycling in a little cardboard box behind this wire rack, and shoes began to collect beneath the rack. Then we added a catalytic heater on the wall by the refrigerator. Eleanor began storing water jugs on the floor behind the rack, too, and we noticed that the recycling bin was often too small. The point of all this is that gradually we had modified the space to suit our style, and we had noted what didn’t work about it. After eight years it was safe to conclude we had a clear pattern of use and our “wish list” was based on experience rather than infatuation. So when Mike & I ripped up the old floor, rebuilding the curbside storage was part of the plan. Added to it is a new microwave shelf suitable for a 1.2 cubic foot microwave, a shelf below the microwave for one of Eleanor’s large pans (probably a cast iron skillet), a black recycling bin that is twice as large as our old cardboard box, room for two 12-packs of canned drinks or four gallons of drinking water, space for the sink covers/cutting boards and a few paper bags, a much larger shoe cubby, the same laundry bin, and a semi-hidden storage shelf for small items like headlamps. The big win of the whole thing is the huge new countertop, made of black walnut with four coats of polyurethane. It measures 18″ x 71″ by itself (8.8 square feet), and gains another couple of square feet when the credenza is fully deployed. With three people in an Airstream and lots of things going on simultaneously, you can never have enough tabletop space. The only thing we lost in this conversion was a magazine rack, which I will replace later when we find a wall-mounted rack that we like. No rush on that. To build this thing took far longer than I had hoped. That’s partly because I didn’t make it easy on myself. I didn’t like the standard steel L-brackets that were available at the hardware store, so I bought lengths of 3/4″ aluminum L-channel and cut brackets from it on the table saw, then drilled four holes in each of them. They aren’t as stiff as the steel brackets but they are a lot lighter and still strong enough. Plus, they’re aluminum—need I say more? The Airstream didn’t make things easy either. 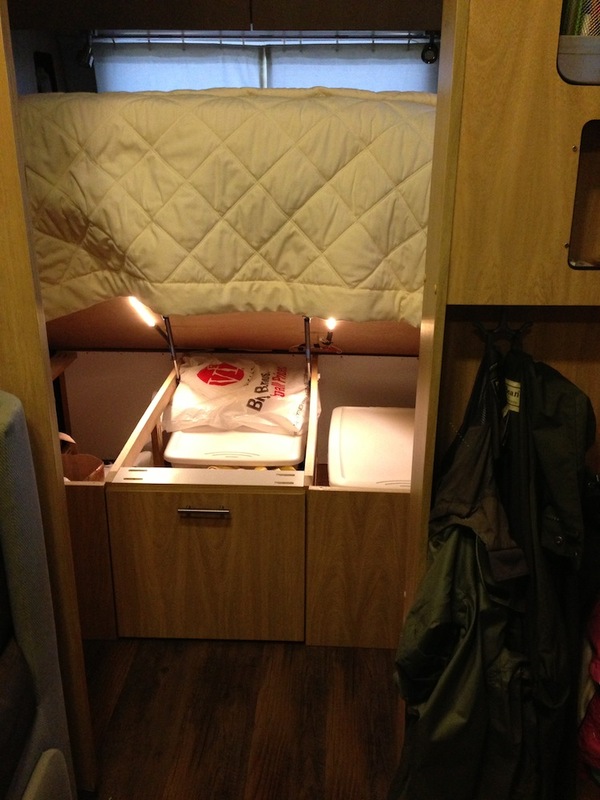 You can’t count on square, level, flat, plumb or tight in a travel trailer. Things move, and they need to flex during travel. So every cut was “custom,” to accommodate gaps, unevenness, and just plain awkwardness resulting from the original construction. Eleanor and I had to stop several time and ponder ways to cover up unexpected issues. I also had to design the cabinet to be light, strong, and yet able to flex a little where needed. Overall, I think the job probably took about 30-40 hours and at least a dozen hardware store runs. So it feels great that it’s done, and I think it looks pretty good. Sure, the black walnut doesn’t match the original furniture color, but I don’t care. It looks much more sophisticated than the original stuff. Because the shelves are black melamine, and the microwave and recycling bin are black, they all tend to visually disappear so cabinet doors are unnecessary. Eleanor even found black no-skid material to line her pan shelf. For those who are interested, here’s a bit more trivia: We used the 3/4″ aluminum L-channel to make trim edges and lips for the shelves. It’s screwed to the melamine with 3/8″ stainless screws. The microwave is attached to the shelf with self-adhesive Velcro and a security strap (made of aluminum) screwed to the side. A low vertical divider holds the recycling bin in place. We found the little organizer (pictured with the headlamp in it) at The Container Store. The countertop, despite being solid wood, weighs only 19 pounds. The entire structure weighs about 35 pounds, not including microwave, which is probably less than the original furniture and the two chairs we pitched out. The key here is that this design suits our way of life when we are traveling. We need convenient, reliable, practical, and durable stuff. We aren’t glampers or weekenders, we’re long-distance travelers and we live in our Airstream for months at a time. Your needs will probably be different. 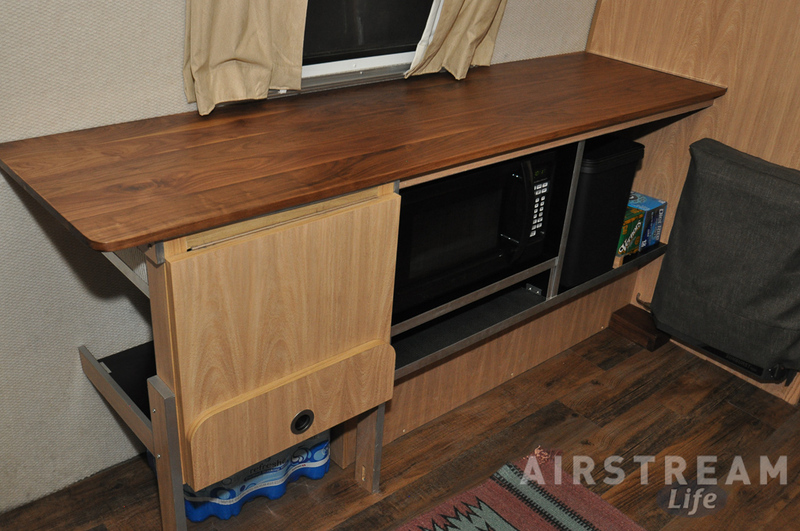 Customizing your Airstream is just like customizing your fixed-base home: everyone has their own needs. 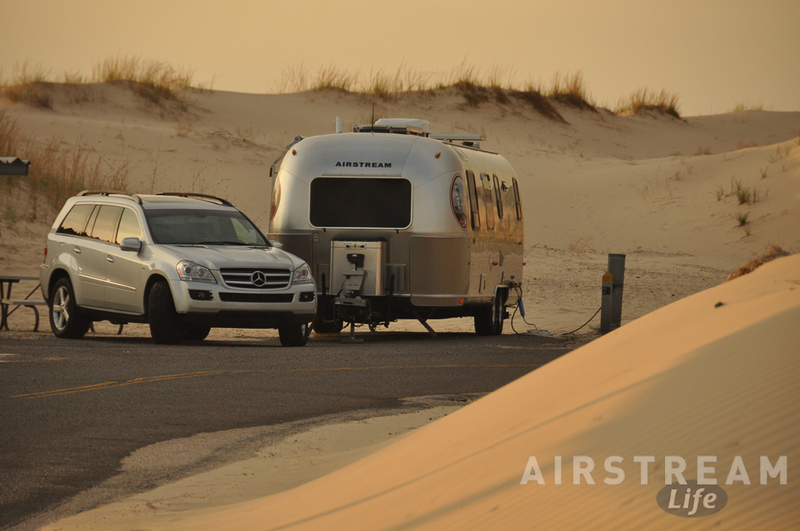 I have never met a full-timer or long-distance Airstream traveler who hasn’t modified their Airstream quite a bit. Even people with brand-new trailers do it. So if you haven’t yet, my advice would be to think about what you do, what you carry along with you, what you most feel is lacking in your interior, and starting planning a few small customizations of your own. It’s easy to start with something as small as an organizer or a hat hook. 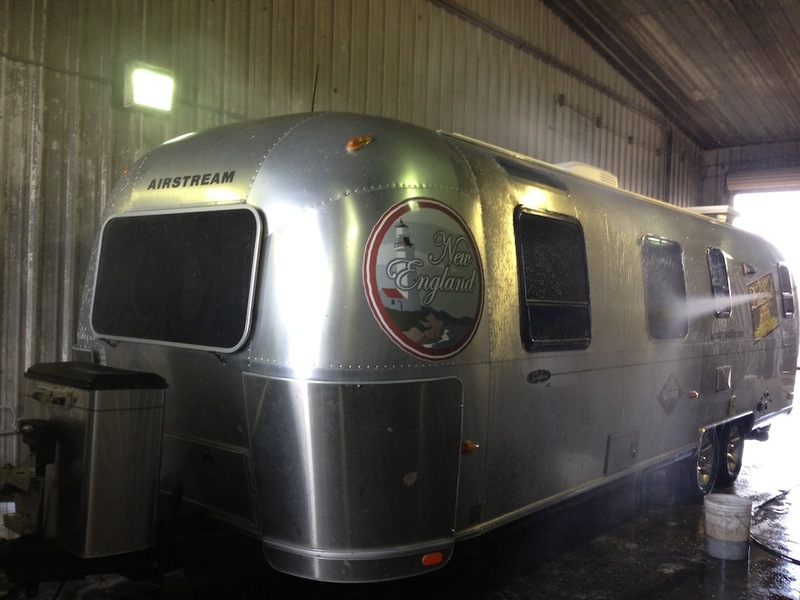 But beware—despite the many hours this latest project took, I can tell you that modding the Airstream is addictive. There will be more in our future.